Mori Bokhara design with red base and ivory border. Vegetable dyed tassels. Primary color is red and secondary colors are ivory and light brown. One of a kind- unique bokhara rug. - Lovingly handwoven by our skilled artisans. 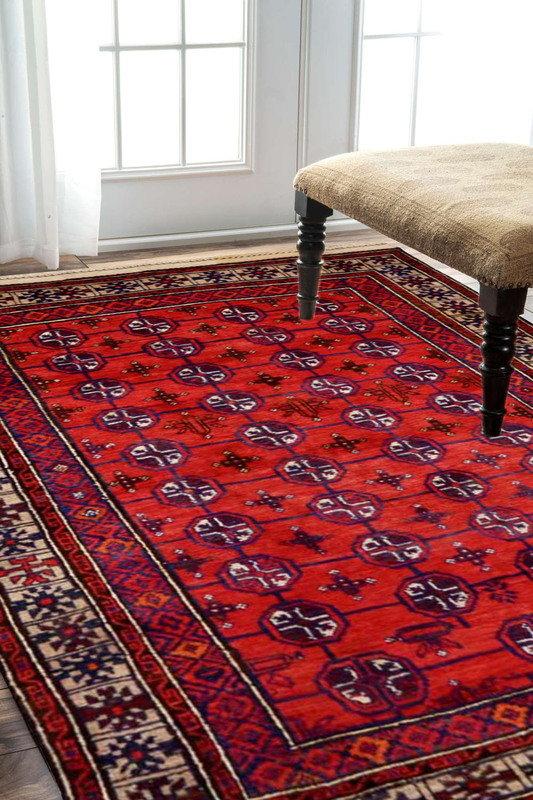 - Exclusive rug from the Mori Bokhara collection handmade in fine quality wool. - Intricate pattern clustered with small motifs. - The design has been originated from the Bokhara region in Northern Afghanistan and is reminiscent of nomadic culture. - Easily washable and requires good care and maintenance. - Easily washable and will be shipped the very next day of an order placed.